Our Progress • Show JumpingFirst Jump Since Camp! Last weekend we had our first jump since camp. For those of you who haven’t been following us for that long, I will quickly catch you up as to why this is a fairly big deal! I had a nasty fall at Riding Camp in June last year which left me with a nasty injury. So surprisingly my riding during this time was very limited and there wasn’t any jumping. Just as I was starting to get back in the saddle, Scottie had a very nasty field injury which put him out of action for pretty much the rest of the year. With us getting back to where we were around November/December time. Add the horrible and unpredictable weather we have had so far this year, having our first jump since camp kept getting put back and back. But last Saturday there was lovely sunshine, several of the others at the yard were jumping and Scottie has been so school sour recently that I thought it would be a great time to have our first jump since camp. Although we hadn’t jumped since camp, I had made sure that we still did some polework, just so that Scottie didn’t lose all his confidence. And we actually had a really good polework lesson a few months where Scottie was incredibly confident. After everyone else had finished jumping, we turned the jumps into small sets of trotting poles. Scottie being Scottie did have a bit of a look at these the first time going over them. But he didn’t take too much convincing and was soon trotting through them fairly happily. After a few goes over the poles on each rein and a bit of a canter, we turned one set of poles into a very small cross pole and trotted into it. Scottie ground to a slow stop. But as soon as I turned back at a walk he walked over it quite happily. He was then happy to trot and canter over it. Next we turned the second set of poles into another small cross. This time we approached in walk and while he protested at first, he then happily walked over it and cantered away over the second cross. Next time round he didn’t think about refusing and we were happily cantering round the two jumps with Scottie really taking me forwards. I am hoping that this doing something different has perked Scottie up a little bit as he has been incredibly grumpy in the school recently. While I haven’t completely ruled out him being uncomfortable, he has very recently had his back and saddle checked, so I think we would be unlucky for there to be something going on there. But also as soon as he stops having a tantrum about going forward, there is absolutely no tension in him at all and he feels very comfortable. So I am 99% sure he is just being a bit bored and grumpy with possibly some spring grass thrown in there too! 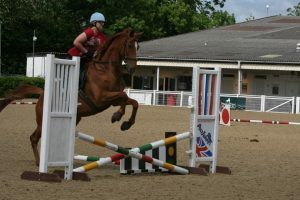 So hopefully doing something completely different has perked him up slightly and my nice willing horse will be back now! I will try and keep things a bit more interesting for him with more polework and new exercises. As for the jumping I will now start cracking on and doing a bit more of it as I have booked us onto a beginners cross country clinic in June to help face any demons we might have lurking after my fall.